This document is disseminated under the sponsorship of the U.S. Department of Transportation in the interest of information exchange. The U.S. Government assumes no liability for the use of the information contained in this document. This report does not constitute a standard, specification or regulation. The U.S. Government does not endorse products or manufacturers. Trademarks or manufacturers' names may appear in this report only because they are considered essential to the objective of the document. 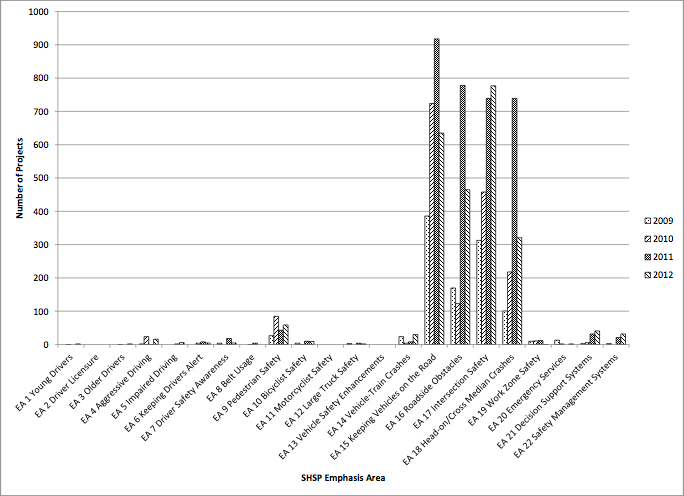 Figure 3: Number of HSIP projects per SHSP emphasis area. The Highway Safety Improvement Program (HSIP) is a core Federal-aid program with an objective of achieving a significant reduction in traffic fatalities and serious injuries on all public roads through the implementation of highway safety improvement projects. The HSIP, similar to other Federal-aid programs, is a federally-funded, state administered program. The FHWA establishes the HSIP requirements via 23 CFR 924, and the States develop and administer a program to best meet their needs. Submit a report that describes the progress being made to implement highway safety improvement projects and the effectiveness of those improvements. The Office of the Inspector General (OIG) conducted an audit of the Highway Safety Improvement Program (HSIP) in 2012.The audit found that "FHWA Provides Sufficient Guidance and Assistance to Implement the Highway Safety Improvement Program but Could Do More to Assess Program Results." The OIG recommended that FHWA annually compile and report data, such as number, type, and cost of HSIP projects to compare the HSIP's national impact across years. The HSIP National Summary Baseline Report compiles and summarizes aggregate information related to the States progress in implementing HSIP projects. Progress in implementing HSIP projects is described based on the amount of HSIP funds available and the number and general listing of projects initiated during the reporting period. In future years, these national summaries may be expanded to include additional information of national interest. 33.3% based on the ratio of lane miles of Federal-aid highways in each State to total lane miles of Federal-aid highways in all States. 33.3% based on the ratio of vehicle miles traveled on lanes on Federal-aid highways in each State to total vehicle miles traveled on lanes on Federal-aid highways in all States. 33.3% based the ratio of the number of fatalities on the Federal-aid system in each State to the number of fatalities on the Federal-aid system in all States. Each State's SAFETEA-LU apportionment of HSIP funds was also subject to a set-aside for construction and operational safety improvements on High-Risk Rural Roads. HSIP apportionment data from 2009-2012 (consistent with the project data presented in the HSIP National Summary Baseline Report) is presented in Table 1 below. The apportionment figures represent the final HSIP apportionment after all set-asides and take-downs. The final HSIP apportionment represents the amount of funding available to States for the advancement of highway safety improvement projects. A summary of HSIP projects obligated from 2009-2012 is provided in the next section. States provide project specific information for all projects obligated with HSIP funds during the state-defined reporting period in their annual HSIP reports. An obligation is a commitment – the Federal Government's promise to pay the States for the Federal Share of a project's eligible cost. The reporting period is defined by the State and can be calendar year, state fiscal year or federal fiscal year. Limited analysis of the project information can be done because not all states have submitted reports in accordance with the HSIP Reporting Guidance. Full use of the HSIP online reporting tool and compliance with the most recent HSIP reporting guidance will enable more complete and accurate reporting of national HSIP project data. In addition, HSIP projects come in all shapes and sizes. For example, some HSIP projects may be much bigger in scope than others, countermeasure installations across multiple sites, or non-infrastructure projects (i.e. transportation safety planning, data improvements). Based on the information contained in the 2009-2012 HSIP reports and summarized in Table 2 below, States obligated $6.5B of HSIP funds for more than 9,000 projects over the four-year period. These obligations include not only HSIP funds apportioned during the reporting period (2009-2012), but also HSIP funds available from previous years' apportionments. The average cost per project across all years isnearly $750,000 per project. A further disaggregation of the HSIP project data from 2009 to 2012 is provided in Appendix B (Number of Projects by Improvement Category) and Appendix C (Cost of Projects by Improvement Category). 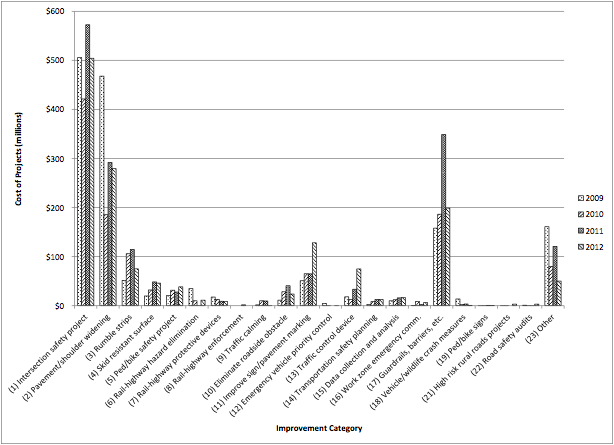 Figures 1 and 2 present this data and summarize the number and cost, respectively, of highway safety improvement projects by improvement category between 2009 and 2012. 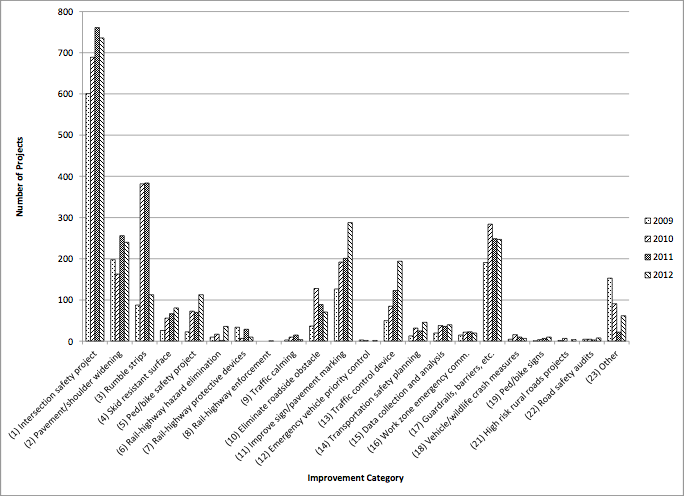 The improvement categories are consistent with example highway safety improvement projects included in 23 U.S.C. 148, 23 CFR 924 and the HSIP Reporting Guidance. The improvement categories related to railway-highway crossings include those projects obligated using HSIP funds. The HSIP National Summary Baseline Report does not include projects obligated with Railway-Highway Crossing Program funds available under 23 U.S.C. 130. Please note that multiple improvement categories may apply to each project; however, improvement categories are selected based on the primary purpose of the project. For example, the State recently completed a pavement overlay at intersection A to improve the skid resistance on the approaches to the intersection. This project could be categorized as (1) intersection safety improvement, (4) installation of skid resistant surface and (11) improvement of highway signage and pavement markings. The State chose improvement category (4) installation of skid resistant surface since that was the primary purpose of the project. The remaining top improvement category for 2009 was "(23) Other", for 2010 and 2011 "(3) Installation of rumble strips or other warning devices", and 2012 "(13) Installation of a traffic control or other warning device at a location with high crash potential". The remaining top improvement category for 2009-2011 was "(23) Other and 2012 "(11) Improvement of highway signage and pavement markings". The total cost of projects for all improvement categories has fluctuated each year with 2011 as the highest. (19) Installation and maintenance of signs (including fluorescent yellow-green signs) at pedestrian-bicycle crossings and in school zones. (16) Planning integrated interoperable emergency communications equipment, operational activities or traffic enforcement activities (including law enforcement assistance) relating to work zone safety. Note: Not all states provided cost data for all projects in a given improvement category. Therefore, the columns labeled as "%" are a calculation of the total number of projects that reported cost divided by the total number of projects in each improvement category. Table 4 and Figure 3 present the number of HSIP projects categorized by SHSP emphasis area between 2009 and 2012. For consistency and national reporting purposes, each State's SHSP emphasis areas were assigned to the AASHTO SHSP emphasis areas. A complete description of each emphasis area is included in Appendix D. Please note that States often times categorize a single project by several SHSP Emphasis Areas. Therefore, for the purpose of Table 4 and Figure 3, a single project may be counted more than once. For example, the State recently completed an intersection improvement project that enhanced safety for pedestrians. This project could be categorized as EA 9 Making Walking and Street Crossing Safer as well as EA 17 Improving the Design and Operation of Intersections and is therefore counted once in each category. The HSIP is a strategic program that uses data and analysis to target safety resources. This aggregate HSIP National Summary Baseline Report shows that between 2009 and 2012, States directed HSIP funds to address the predominant infrastructure-related crash types – roadway departure, intersection and pedestrian crashes. Safety performance is measured by a reduction in the rate and number of fatalities and serious injuries on all public roads. There are many complexities associated with directly attributing reductions in fatalities and serious injuries at a national level to any one program. Existing modeling tools cannot isolate the safety effect of specific infrastructure and behavioral programs. However, we know that the programmatic activities to drive down fatalities and serious injuries need to be as varied as the causes of the crashes themselves. That is why, at the U.S. Department of Transportation, we continue to aggressively pursue a holistic approach to safety that includes engineering, enforcement, education, and emergency medical services. AASHTO, Strategic Highway Safety Plan, 2005. FHWA, HSIP Reporting Guidance, May 15, 2009. OIG, FHWA Provides Sufficient Guidance and Assistance to Implement the Highway Safety Improvement Program but Could Do More to Assess Program Results. Report Number: MH-2013-055. March 26, 2013. (6) Construction of any project for the elimination of hazards at a railway-highway crossing that is eligible for funding under 23 U.S.C 130, including the separation or protection of grades at railway-highway crossings. (17) Installation of guardrails, barriers (including barriers between construction work zones and traffic lanes for the safety of road user and workers), and crash attenuators. (21) Construction and operation improvements on high risk rural roads.